Coffee beans come from the ripened fruit of various coffee tree species. First of all, there are two primary coffee bean species that are used for brewing. Arabica (\ə-ˈra-bə-kə\) beans, originating in Yemen, are the more flavorful and higher quality bean variety and have a higher production cost. This increased production cost often stems from the fact that coffee trees flourish on steep mountain sides where heavy farm harvesting equipment is unable to be used. Therefore, Arabica beans sell at a higher price, even though making up 75-80% of global production. The second common variety, Robusta (\rō-ˈbəs-tə\) beans, are used mostly in instant coffees and more popular commercial blends. 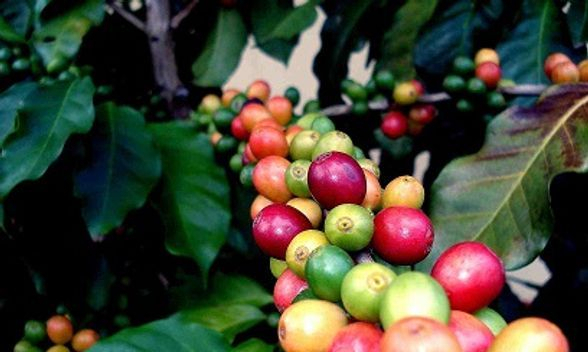 Arabica trees are most productive when grown between 2,000 and 6,000 feet above sea level. Furthermore, the ideal climate includes year round temperatures around 70 Fahrenheit and abundant rainfall. These conditions are found in a narrow range roughly 100 miles north and south of the equator, primarily in Central and South America, and in eastern Africa. Robusta is found at lower altitudes below 2,000. Indonesia and west Africa are home to most Robusta trees. As the trees mature, they reach a height near 20 feet. However, most are pruned to 5 feet for convenience during harvesting. The trees are self-pollinating and grow white jasmine-scented blossoms. These blossoms fall to the ground after 2 to 3 days and are replaced with green "cherries." The cherries continue to change from green to yellow to red before becoming ready to harvest. The beans that are used for coffee are actually the seeds within the cherries. Each cherry has two hard beans facing each other within the skin covered pulp. *As you can see from this picture, cherries ranging from green to fully ripe can be found on the same branch. Some trees are visited up to 5 times to get all of the possible fruit! Hand picking cherries from the coffee trees is hard work! Each person harvesting can collect around 200 lbs per day. On the other hand, of that 200 lbs, approximately 20% becomes the roasted coffee. Coffee must be quickly processed following picking to ensure that the beans do not begin to break down or lose flavor. Two processing methods are used: wet and dry, or unwashed. The wet method is use primarily for Arabicas. The first step involves breaking the cherries so that the beans are exposed. Next they are soaked in fermentation tanks to remove the coatings from the beans, before being washed clear. Beans are then sun-dried for 2-3 days. Lastly, a machine removes the inner parchement and silver skins. Washed coffee tends to have clean flavor, greater acidity, and is typically free from undesirable elements. The dry, or unwashed, method of processing begins with cherries that are partially dried on the tree and finish sun drying for 2-3 weeks. 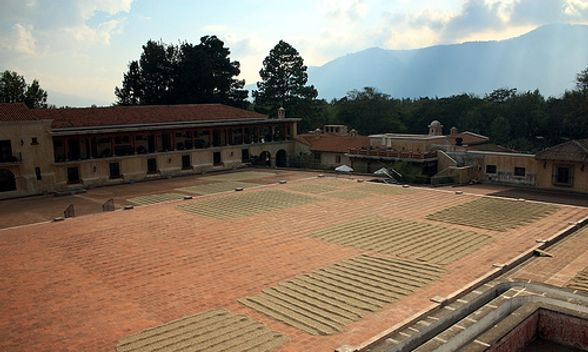 During this period, the beans are raked multiple times a day to further facilitate drying. A husking machine then removes the dry pulp and parchment. Dry processed beans tend to have heavier body, but can potentially develop off-tastes from being exposed to the elements for a few weeks. Ever get a bad pot of coffee or a pound of off-taste? This can be the result of just a single defective bean! As a result, specialty coffees are higher quality because of the intense scrutiny and meticulous care in sorting out the bad beans. There are electronic and manual methods that ensure only the best beans make their way to the consumer. To keep our coffee as fresh as possible, our roaster pumps nitrogen into each bag before vacuum sealing the freshness in! Unlike a large can of coffee from the store shelf, which has to be repeatedly reopened and keeps flavor-robbing air in, our coffee won't go stale for months. The most important information regarding coffee and caffeine is that there is no relation between the strength of the coffee's taste and the caffeine levels! While caffeine itself does have bitter taste, the strength of coffee comes more from the roast and/or the ratio of coffee and water in the brewing process. A typical 5oz cup of regular coffee will range from 60 to 180mg of caffeine, depending on the types of coffee used in the blend and the roast. As for espresso, a 1.5oz cup will range in caffeine content from 90-120mg. The caffeine itself is hardly altered during the roasting of the beans. Arabica beans contain about 1% caffeine by weight, when green. On the other hand, robusta beans have about 2% caffeine by weight. 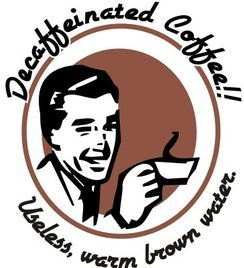 In order for a coffee to be marketed as decaffeinated, the methods used must result in coffee which has 97-99% of the caffeine removed. Where a cup of regular may contain 100mg, a similar cup of decaf contains less than 3mg. Decaffeination begins with increasing the moisture saturation within the beans. This allows for easier extraction of the caffeine. A solvent (various ones used) is then applied before the beans are dried and processed for shipment to roasters. What Makes a Great Brew? It is important to understand that brewing is simultaneously extraction and dilution of the flavorful compounds in the ground coffee. 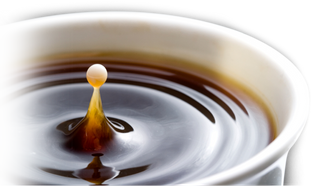 A typical coffee beverage is 1% coffee and 89-99% water (accounting for creamers, sugar, etc.). 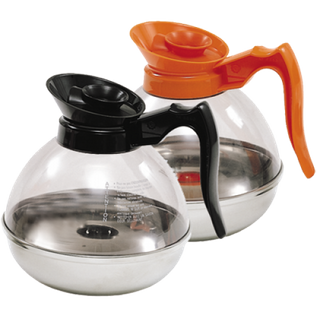 The "freshness" of the coffee depends on the equipment used to brew and store the hot coffee. For example, a coffee urn has a hold time of 90 minutes. This means that from the beginning of the brewing, the coffee will taste fresh for 90 minutes. After that the coffee may begin to slowly develop a "burned" or stale taste. On the other hand, coffee which is brewed into a typical glass decanter (bowl/pot) has a hold time of about 20 minutes while sitting on a warmer. · Miscela - refers to the blend of beans used; this varies greatly depending on the roaster. Also available are single-origin beans. · Macchina - the espresso machine needs to be reliable in temperature and water pressure to ensure the best extraction of flavors in your espresso. While coffee is typically brewed at 185°, water used for espresso can range from 192° to 198°F at brewing. · Mano - the “hand” of the creator is the most important ingredient in the process. Real espresso, and its derivatives, are made by hand, and a skillful hand makes them that much more delightful. The best tasting tea involves the actual high quality leaves, while other, lesser teas often consist of the dust leftover from processing. Furthermore, the temperature required for steeping varies by tea. The chart below (adapted from Teavana) indicates the best water temperature for various kinds of tea. Additionally, it should be noted that the steep time varies according to each specific tea. 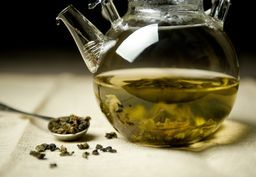 Green tea has one of the shortest infusion periods, often 45-60 seconds. On the other hand white or herbal teas can take as long as 4-6 minutes. It is important to know that if you desire a stronger tea, add more tea, not more time. Often teas are quite sensitive and will become bitter tasting if steeped/infused longer than necessary. Also, if blending two teas, use the tea with the lowest temperature and time suggestion. The benefits of tea are continuously improving. Check out an article from the Denver Post!